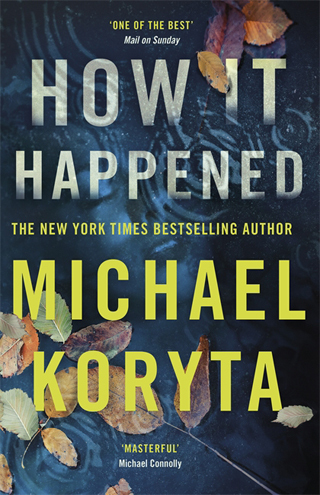 How It Happened by Michael Koryta – Book Review . As a former private investigator and newspaper reporter, and now a best-selling crime novelist, Michael Koryta is clearly well positioned to write this thriller about an FBI agent aiming to uncover the guilty party/parties in an investigation into a particularly callous and calculated murder. With more than 10 novels to his name and a string of awards, I expected a lot from How It Happened, the latest addition to his canon. Sadly, I was disappointed. In fact, I suffered a reaction worse than disappointment – I was bored. That’s not to say there isn’t some merit in aspects of Koryta’s novel, with a lurking sense of evil pervading parts of the story and some seriously unpleasant characters to boot, but by the end, actually not even that far into the tale, I didn’t overly care what happened to any of them, for good or bad. When I don’t care about characters, main ones or peripheral, it doesn’t bode well. When I also don’t really believe that the characters would behave in the way they do, or how the narrative is strung together, then apathy and frustration take over. It’s even more vexing when there are snippets in there that could have worked so much better, including the odd character that should have been the star of the show instead of winding up dead. How It Happened starts and pretty much ends with confessions by two of the leading protagonists, strands of the novel that actually worked well. Perhaps more of this throughout the book would have helped, rather than the linear tale focusing largely on FBI operative Rob Barrett. Barrett finds himself in an unenviable situation, torn between believing a seemingly unbelievable witness, or carving out for himself a much easier life and following the version of the truth that the rest of the community in rural Maine try so desperately to get him to swallow. Again, there are elements of this that a decent novel could hang from, but the fact that lead character Barrett is so much of a drip, although an admittedly dogged and stubbornly brave one at times, that it’s hard to feel any sympathy for him when wave upon wave of bad luck and co-ordinated nasty deeds come his way. The setting of Maine could have been a masterstroke and is clearly a beautiful place to live and work, but not enough was made of this, with only one of the grief-stricken characters regularly invoking the reality of living and working in such a stunning, but challenging environment. Koryta seems torn between a rock and a hard place – using the Maine coast as his simple backdrop at times, but trying to shoehorn in several setpieces in some of the seedier, urban dives of the area. These are the places where some of the more unsavoury characters are found and introduced, but too many of them become caricatures rather than believably menacing and relevant additions to the narrative. I may be being a little harsh on the author, but that’s what comes from disappointment; when the seed of an idea could and should be so good and gripping, but becomes a bit too vanilla to please the palate.